Sigh. This map was way too dark in the entire map... Not much here in creativity. Although it was fun, it gave spiders a distinct advantage, I don't mean to preach that all maps are advantageous to spiders but when the entire map is WAAAY too dark then there is something wrong. The author should have read the Map Rules. Ok enough of my critique. I will go back a bit on my review. The author contacted me and was very nice, he did not flame me and actually thought of my review as fair, I wish more people would act like him :) Good attitudes go a long way. I wish I could be like that, heh I usually get defensive I'm gonna have to work on that ;) Anyway, I played it again and with a smaller group, the results were a bit better ironically. I would suggest playing this map with at MOST 8 people. More than 4 spider players is just plain stupid because as I said before it was too dark. Comment: Kept in tune with a Storage Factory, what else? 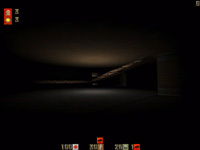 Comment: Very dark and mostly corridors with very dark areas with boxes and crates in them. Comment: A storage factory how creative can you get with that? This review has been read 1666 times. The Gloom Map Depository is copyright Team GMD. Quake2 is a registered trademark of Id Software. Gloom is copyright Team Reaction. The review script is copyright R1CH.